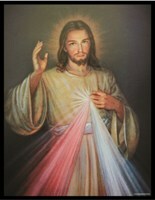 "The Divine Mercy Stained Glass Art" is a 7" x 9" Christian art piece that would enhance any home décor setting. It is a powerful rendering by Saint Faustina Kowalska, a Polish nun. It is recorded within the Roman Catholic sacred circles that Jesus communicated to the world through this chosen nun, His message of God's mercy.